Michael Chin was born and raised in Utica, New York and is a recent alum of Oregon State's MFA Program. He won Bayou Magazine's Jim Knudsen Editor’s Prize for fiction and has work published or forthcoming in journals including The Normal School, Passages North, Iron Horse, Front Porch, and Bellevue Literary Review. He works as a contributing editor for Moss and blogs about professional wrestling and a cappella music on the side. Find him online at miketchin.com or follow him on Twitter @miketchin. 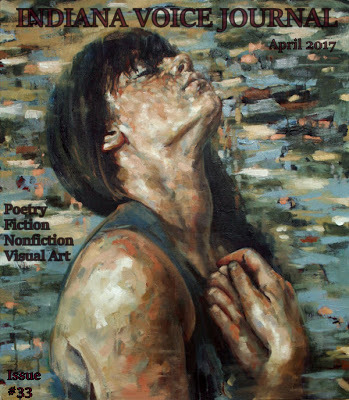 Three Poems by Donal Mahoney: "A Limp Others Can’t See," "Mourning a Child at Midnight" and "At Least Now I Can Say Goodbye"
Two Poems by Kevin Doherty: "AFTER THE RAIN" and "ON FINALITY"
Kevin Doherty is a 63-year-old native Californian who lives in Long Beach. He enjoys freelance writing, visual art making and creating autobiographical poetry as a means to process and make meaning of personal experience. He works as a designer and art teacher by day and plays solo pre-war Country Blues on acoustic guitar in small venues on weekends. A Poem by Bob Eager: "Melba Toast Kind of Feelin' "
Bob Eager’s work has appeared in Stray Branch, Leaves of ink, Camel Saloon, Vision With Voices among others. Bob also can be seen reciting poetry on a video channel called Charisma Corner: https://www.youtube.com/watch?v=t4LE_Mq1x2w. In this poem, Bob addresses the question: "Is Melba Fake or Real Toast?" Three Poems by Robert Ronnow: "White Waits," "in a Day," and "Absolutely Smooth Mustard"
Robert Ronnow's most recent poetry collections are New & Selected Poems: 1975-2005 (Barnwood Press, 2007) and Communicating the Bird (Broken Publications, 2012). He lives in Williamstown, Mass. Visit his web site at www.ronnowpoetry.com. Three Poems by Sarah E. Morin: "MARILYN UNWRAPPED," "I AM A WOMAN OF MANY COMPLEXITIES," and "EULOGY FOR A SLINKY"
Sarah E. Morin has three great passions in life: God, books, and working with young people. She serves as a kidwrangler at Conner Prairie History Museum in Fishers, Indiana. She writes and performs unruly fairy tales and poems. Her first Christian fantasy novel, Waking Beauty, was published in April 2015. She is a member of American Christian Fiction Writers and a state officer of Poetry Society of Indiana. When she grows up she wants to be a child prodigy. Visit her at sarahemorin.com. Three Poems by Denny E. Marshall: "Haiku (No Title)," "Transformer," and "Lost on a Line"
Three Poems by Dan Jacoby: "city of new orleans, illinois central," "landscape," and "obligations"
Dan Jacoby is a former principal, teacher, coach, and counterintelligence agent. He is a graduate of St. Louis University, Chicago State University, and Governors State University and lives in Beecher and Hagaman, Illinois. He has published poetry in Anchor and Plume (Kindred), Arkansas Review, Belle Rev Review, Bombay Gin, Burningword Literary Review, and Indiana Voice Journal, to name a few. He He is a member of the American Academy of Poets and the Carlinville Writers Guild and was nominated for a Pushcart Prize in 2015. He is currently looking for a publisher for a collection of poetry. Two Poems by Carter McClure: "Nowadays,,,." and "i hope you LIKE this"
Carter McClure is a senior Elementary Education Major at Ball State University in Muncie, Indiana. He says he has lived in Muncie for 22 years, and people make fun of him when he tells them he has no desire to leave. More of his poems can be found at: https://mehthodology.wordpress.com/. Toni Cogdell lives and works in Bristol, UK, from her woodland studio. Exhibiting her paintings across the UK for many years, she has honed her process and technique to give voice to her expression, a personal style seeking to connect with the world around her. She loves to write as part of her expression and her written pieces like to exist nearby her paintings, gently trailing from their coat-tails. In walking the space between figuration and abstraction Toni finds a freedom which allows her to go deeper into the intangible substance of the psyche and human condition without restricting or enforcing definitive ideas. Pulling recognisable truths into the work while giving reign to the unknown and ensuing contradiction to hold its own space, her paintings are looking for a balance, a kind of peace. In every journey travelled there is darkness as well as light, with more questions than answers. And these are the places Toni looks to find beauty. CNF/Essay/Visual Art by Eric Hill: "A Matter of Time"
Telling a story is my priority no matter what the Medium or Style … A Seduction of Color, Composition, Light/ Shadow revealing a sensation of being. I draw images from the unconscious by spontaneous action over a ‘Section de Or’ grid, then apply Elements of Abstract, Cubism, Symbolism, Expressionism, to heighten the sensation / meaning. I want to leave the Viewer with an insight into the Interior Worlds, like an inward looking Mirror. Adam Matson's fiction has appeared internationally in over twenty magazines including The Indiana Voice Journal, Straylight, Soundings East, The Bryant Literary Review, The Berkeley Fiction Review, Morpheus Tales, Infernal Ink Magazine, and Crack the Spine. He is the author of a collection of short stories, Sometimes Things Go Horribly Wrong (Outskirts Press). Ethan Danner is a resident of South-East Arkansas where he is an English student at the University of Arkansas at Monticello. Danner's short stories reflect the southern world and people around him. He explores the minds of the southerners young and old on issues big and small. Ethan has a love for beautiful prose and it shows through in his writing, especially when writing about nature in all its small intricacies.